The best windows will only perform well if your Chesterfield, Missouri, windows company installs them properly. 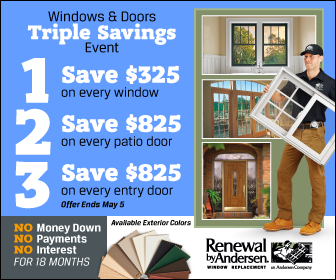 Fortunately, Renewal by Andersen ® of St. Louis’ window installers take pride in a job well done. That is why they consistently score the highest in our customer satisfaction ratings . They use their expert technical skill and judgment to figure out whether the right solution for your home is an insert or full frame replacement window. The insert window installation makes sense when the casing and trim needs to remain in place throughout the installation. They old window frame and sill also need to be in good condition and remain solid. In addition, insert installations make sense when the existing construction allows the sound use of the insert. Before your installation, our expert will examine the condition of your windows to determine the right installation method. If our expert in Chesterfield doors and windows determines that a window insert makes sense, then they will take measurements. During installation day, we will begin the process by removing the appropriate exterior and interior stops and the sash. They will also remove all the weights and pulleys if your window is a double-hung. We will then insulate the gaps and weight pockets, and then prepare the surface for a new insert. Your current window’s frame and casing remains in place all throughout the process. Unlike other insert windows, our products have narrower frames and more glass area for a better view. This makes sense when the old window is deteriorated beyond repair or if the existing window frame doesn’t allow insert window replacement. In a full frame replacement, our installation crew will remove the window frame and sash, exposing the rough opening. They will then check for damaged framing, and repair or replace as necessary. They will also check the flashing and drip cap. Afterwards, they will insulate any gaps and prepare the window surface. We will then place your new window into the rough opening, square it, insulate it, and case it with interior and/or exterior trim. Renewal by Andersen of St. Louis is the leading choice for replacement windows in Chesterfield, MO, because of our professional installation and superior products. Our windows feature durable Fibrex® material frames and energy-saving High-Performance™ Low-E4® glass. Thanks to these features, our products can save up to 25% on your home’s energy bills depending on your home’s location. Call us at (314) 332-2364 to learn more about our replacement windows. You can also request a free estimate.